I haven’t written about the girls in a while. They used to give me a lot to write about – good and bad – but, they have matured and settled down and I don’t have as many funny stories to tell. They are getting older – Katie is 7, now, and Megan and Amy are both 5 – and are no longer puppies or young dogs. That in no way implies that they aren’t still playful – just that they don’t get into as much trouble as they used to. It is because they are now older and more settled that I am worried about how they will react to being uprooted and moved to a new home in a new state. With all this talk about moving to Albion and getting a new house and starting a new chapter in my life, I haven’t talked much about what that will mean for the girls. That doesn’t mean I’m not thinking about it and worried about it. If Puddles was still alive, I wouldn’t be at all worried about her. She started out living on Steele Street with us, then moved with me to Deep River Road, and finally to my current home. She went everywhere with me and traveled all over the east coast with me many times. She was comfortable anywhere she went and quickly settled in wherever we stayed. But, with Katie, Megan, and Amy, the situation is different. This is the only home any of them have ever lived in and they are very comfortable and secure in it. Katie is the only one that has ever traveled with me and, although she quickly adjusted when we got there, it still created some anxiety for her. Other than frequent stays at Rae-Zor for doggie-day-care or boarding (which they absolutely LOVE), they really haven’t had to get used to new surroundings. I’m worried that this move will be traumatic for them and that it will take time for them to adjust and feel “safe” again. I think Katie will be fine — it will cause her some anxiety and she’ll likely have a rough time, but I doubt it will last too long. She is my social butterfly and I’m sure getting to know new people and exploring her new house and yard will distract her and help her cope better than the other two. I’m concerned, but not terribly worried. Amy is the shy one, but after a while warms up to new situations. It will take her longer than Katie to adjust, but I am worried she may revert back to some of her nervous, scared tendencies that took so long to get her to overcome. Over all, though, I think that as long as Katie is there and she sees Katie is OK, then she’ll be fine, too — they are two peas in a pod and as long as they are together, I think Amy will be OK. It is Megan that worries me the most. Megan is very much a “home body” and Mommie’s girl. She does fine at Rae-Zor’s and has learned to enjoy her time there, but she really doesn’t like to be out of her element at all. It puts her in a major tail spin when I take her shopping at PetSmart, to Santa Paws events, or other places that she is unfamiliar with and around people she doesn’t know. It really scares the daylights out of her — she gets nervous, clingy, and sometimes even gets sick to her stomach. When we get home, she acts scared and clings to me for hours – sometimes days, if it was a particularly traumatic situation for her. I know that she’ll eventually be fine — she’ll adjust and the new home will become her safe zone. I’m just worried about how long that may take and how she will react in the mean time. The saving grace will be that we’ll all be together and I won’t be going to work and leaving them alone in a strange place all day. Also, the furniture will all have their scent on it and all their toys and “stuff” will be there as familiar sources of comfort for them. 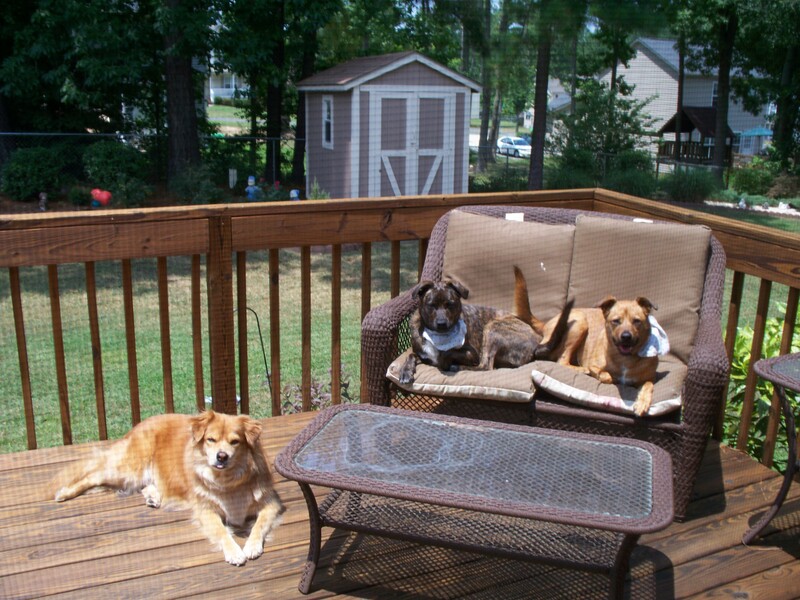 They will also have a huge fenced in back yard to run off their energy in. Maybe I’m worrying too much – maybe it’ll be just fine, but I can’t help it — I know it is going to create anxiety for them on some level. I need to take them to All Animals for their annual visit before we move, so I plan to take advantage of that time to talk to Dr. Cindy and get her advice. I’m hoping for some medication that will help them on the long drive up to NY (standing at attention and panting at the windows won’t make for a very fun 900 mile drive) and advice on how to help them adjust when we get there. So, anyway — I’m sure the old girls will be fine, but I know it will be stressful for them, so I need to think it all through and make sure I’m doing the best I can to make it as easy a transition as possible for them! Any thoughts? I’ve never had to help pups adjust, but I think you’re right that having you and their things at the new house will help.